What is the Alaska Transfer on Death Revocation? Effective July 21, 2014, owners of real estate in Alaska can take advantage of a useful estate planning tool: the transfer on death deed (TODD). Find the full text of this new law at AS 13.48. This statute is based on the Uniform Real Property Transfer on Death Act (URPTODA). By adopting the provisions of the URPTODA, Alaska joins with an increasing number of states using this law to help land owners manage the distribution of what is often their most significant asset -- their real estate -- by executing and recording a transfer on death deed. Geared to life's unpredictability, the law also includes a mechanism to modify or revoke the previously recorded TODD (AS 13.48.070). Executing and recording the revocation form allows the owner to cancel the recorded TODD, providing an obvious beginning and end to the interest it contained. At that point, the owner has a blank slate with regards to the property, and so can proceed with any plans for it while maintaining a clear chain of title. The chain of title refers to the property's ownership history. Many sales and mortgages require title searches, and a clear chain of title simplifies that process. Recording the revocation for cancelled or changed transfers at death can prevent what's known as a "cloud" on the title. A clouded title contains missing, incomplete, or otherwise inaccurate information, and generally slows down the title search. Each situation is unique, so consult an attorney with specific questions or for complex circumstances. 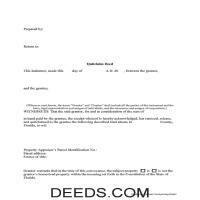 Get your Kenai Peninsula Borough Transfer on Death Revocation form done right the first time with Deeds.com Uniform Conveyancing Blanks. At Deeds.com, we understand that your time and money are valuable resources, and we don't want you to face a penalty fee or rejection imposed by a county recorder for submitting nonstandard documents. We constantly review and update our forms to meet rapidly changing state and county recording requirements for roughly 3,500 counties.